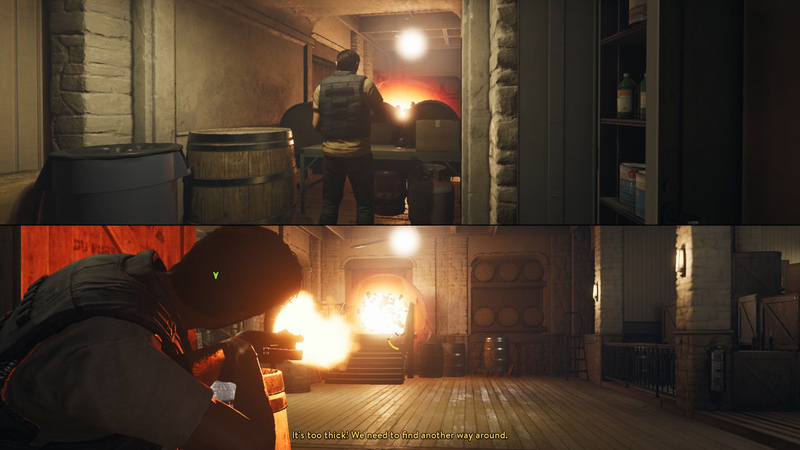 All of Vincent and Leo’s hard work has amounted to this major moment in A Way Out, confronting Harvey and getting vengeance. The whole purpose of Vincent and Leo’s escape from prison has led to this point, seeking vengeance on Harvey for what he’s done. 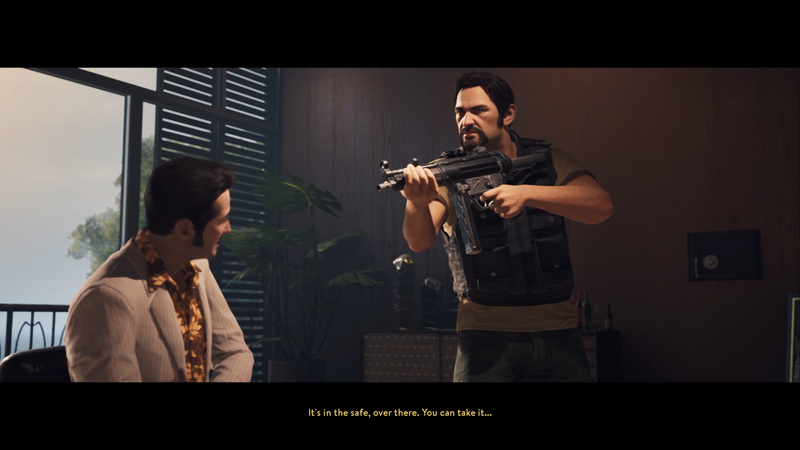 In the fourth chapter of A Way Out, Vengeance, Vincent and Leo will need to make their way to Mexico, assault a compound, take down Harvey, and then escape on motorbikes in the jungle. Before you can exact your revenge, Chapter 4: Vengeance starts with an important decision: parachute down to the island or land the plane safely. Choosing Vincent’s way means that Leo and Vincent will need to jump out of the plane and parachute down to the landing zone. After getting the plane in order, “Free Fall” is your next stop. If you decide that jumping out of a plane is madness, Leo’s idea involves landing the plane and walking through the jungle. 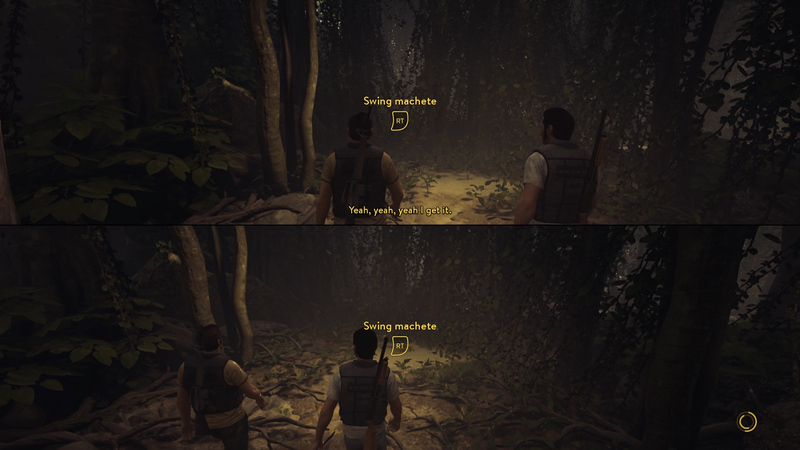 Once you land, Vincent and Leo will need to use machetes to clear vines in order to reach the next area. After leaving on the plane and making the short walk with machetes, the next stop is “The Trek”. You can take your time with these and even explore the hangar. 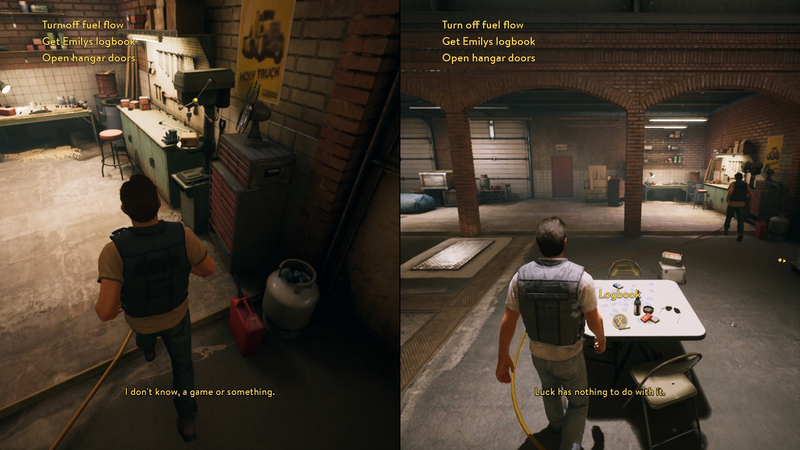 At the rear of the hangar is an arcade machine, playing together unlocks the Achievement/Trophy, Break From Reality. When you’re ready, you can collect Emily’s logbook off of the folding table near the arcade machine. Take the logbook to Emily, you can find her sitting in the pilot’s seat of the plane. Turn off the fuel by following the fuel lines back to the tanks. With the fuel flow severed, detach the fuel line from the base of the plane. Finally, head to the front of the hangar and push the doors open and then get in the plane so you can take-off. 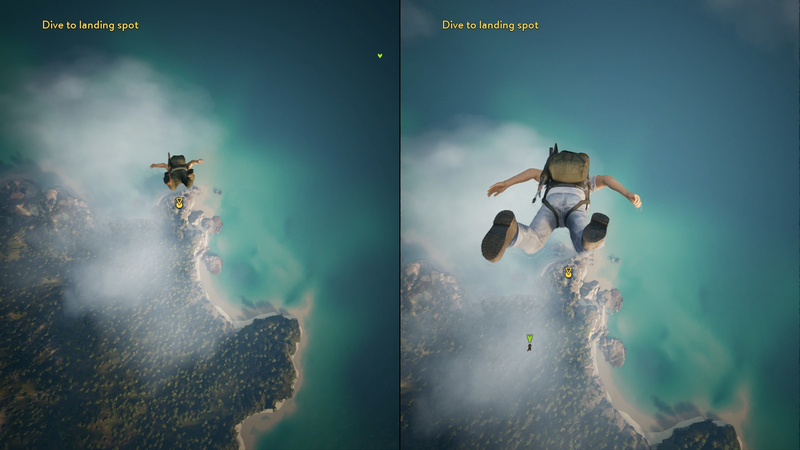 Free Fall is a fun moment in A Way Out where you must dive down to the landing zone. Halfway down, Leo runs into some trouble with his parachute, at which point Vincent will need to zip down and help him. Angle for the landing zone and enjoy the glide down to land. With your feet firmly back on ground, you will need to make your way through the jungle of Mexico to Harvey’s compound. This is a short moment before everything kicks off, so take this time to catch your breath and prepare for the coming storm. How you progress in the first section is up to you, either take out the guards with your weapons or sneak up and knock them out for a silent approach. If you choose to “go loud”, some reinforcements will arrive, but regardless, you’ll be “going loud” shortly. After the little fire fight, you’ll enter a new area that is being protected by an active sniper. Use the wall to avoid getting shot and use the following shoulder-high walls to protect yourself from the sniper. Enter the building and use the crawl space to reach the next area. Only one person will be able to use the ladder, the other will fall to the ground. Whoever goes up the ladder first will take out the sniper and then provide covering fire for the person who tried to go up the ladder second. Take down the bodyguards as they come pouring into the little arenas and use the shoulder-high walls as cover. Continue this pattern until all the hostiles are gone, jump down into the little garage and work together to open the roller door. Follow the path along the cliff and push the dumpster out of the way. This next area is full of hostiles who do not know you’re coming, so you can take them down silently or begin shooting. Work your way through the hostiles to the mansion’s gate. 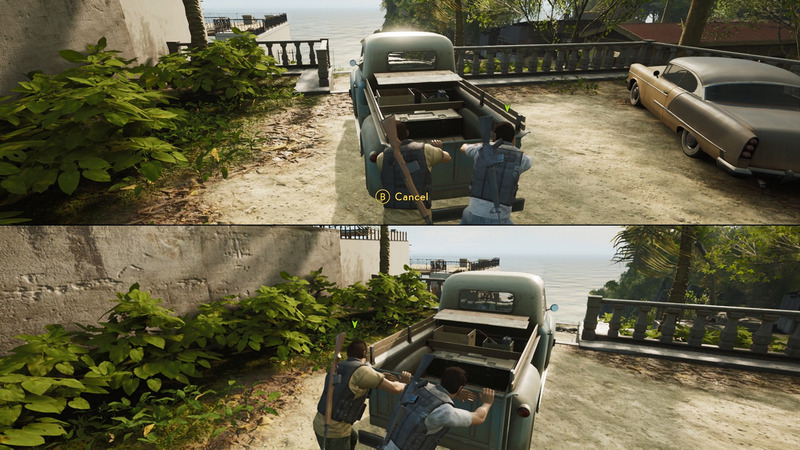 Take out the enemies and then climb the nearby steps to find a vehicle. Push the vehicle down the steps to open another way into the mansion. After jumping through the hole in the fence, you’ll come across a stash of weapons before entering the mansion. You can choose to swap your weapon out here, but really, the long-range weapons are an excellent choice as the combat doesn’t switch to close-quarters. Shoot the lock off the gate to gain access to the mansion. As you enter the mansion, two hostiles will block a door and begin shooting through the holes. Work your way around the room using the boxes and pillars as protection. Run up the other set of stairs to find a propane tank nearby. Throw the propane canister at the door and shoot it to cause an explosion. Work together to move the beam and continue the fight outside. With all the enemies dead, head inside to a grand foyer and enjoy a Scarface-like scene where Vincent and Leo must take down hostiles while avoiding Harvey’s grenade-launcher attacks. With all the enemies down, run up the stairs to reach Harvey. The last section of the mansion ends with you deciding who deals with Harvey: Leo or Vincent. Choosing Leo’s way lets Vincent pick up the gun while Leo approaches Harvey and yells at him for betraying Leo. Choosing Vincent’s way sees Leo pick up the golden pistol while Vincent walks up to Harvey. Harvey will open the safe and give the diamond to whoever chose to confront him, he will then take that person hostage. Whoever is held hostage will need to struggle over to the glass case where they can smash Harvey into it. 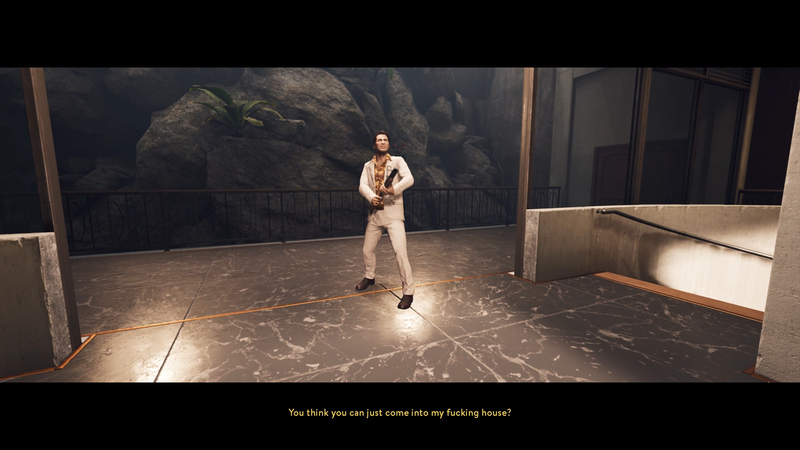 The player with the golden gun must shoot Harvey and then both characters can unleash into Harvey with their weapons – they have unlimited ammo, so have fun! With Harvey dead, all you need to do is escape. 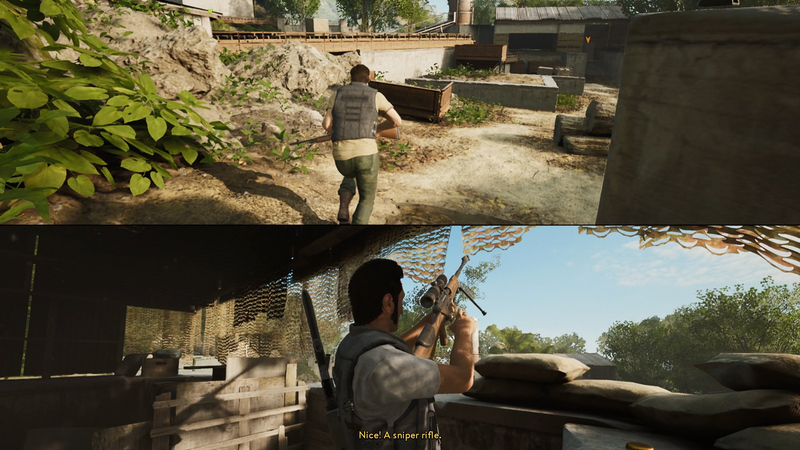 The Jungle Road section of A Way Out’s Chapter 4 is extremely fast-paced with a whole lot of gunfire. Try not to smash into one another, as that will slow you down and potentially knock you off-course. 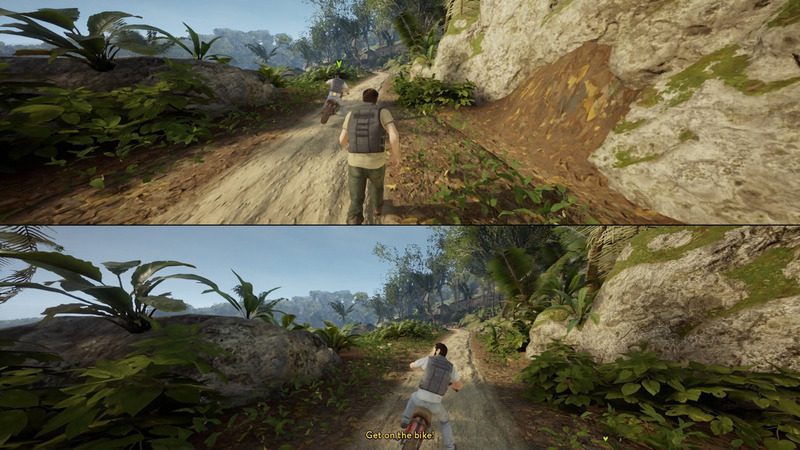 Take whatever route through the forest you like, just try to avoid the jeeps full of mercenaries. When they start using grenades, just keep the gas full throttle, there’s no way to avoid damage. Eventually, someone will get knocked off their bike, at which point they will need to get on the back of the other bike and start shooting. You’ll continue in this fashion, one person driving while the other destroys jeeps, until you reach the runway. Drive alongside the plane to let the person on the back in, and then the player who is driving will need to catch back up and jump into the moving vehicle. Now that Harvey is dead, Vincent and Leo can rejoice. But there’s more to come in the next part, Chapter 5: Conflict.